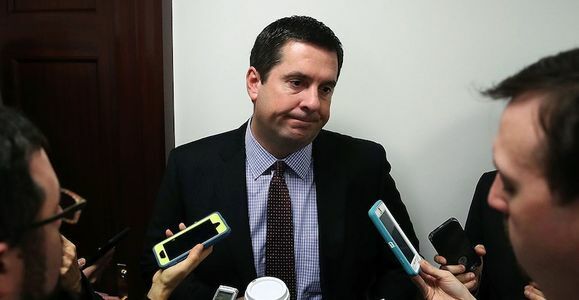 House Intelligence Committee Chair Devin Nunes, Republican Representative of California's US House District 22, has demonstrated that he is incapable of leading an independent oversight investigation of the actions of the Trump administration and allegations that it, members of the Trump transition team or the Trump campaign may have interacted with foreign nationals — wittingly or unwittingly — to the detriment of the United States of America and its democratic institutions and processes. As a former US Army Intelligence officer, I am angered and dismayed by his blatant disregard for the protection of classified information, for his pitiful attempts to equate 'leaks' with allegations of misconduct now actively under investigation and with his personal disclosure of his concerns and suspicions. Representative Nunes has violated the 'first rule of classified information' by publicly discussing his assertion that members of the Trump administration or transition team may have been incidentally identified in conversations or communications with representatives of foreign powers, by intelligence services operating lawfully under FISA provisions. He asserts that he has been provided 'dozens' of intelligence work products such as estimates, reports or warnings by one or more unidentified parties which resulted in the 'unmasking' of such individuals. His responsibility is NOT to disclose such concerns to the public nor to any member of the administration outside of the confines of his committee. His job IS to provide oversight of all elements of this administration, and disclose classified matters only in a framework where any and all allusions to such information are protected from compromise. He cannot and should not discuss or disclose classified information to members of the media, or to report it to an administration whose members, advisors or past associates may be under investigation. Please sign this petition to demand that Speaker Paul Ryan immediately force Representative Nunes to step aside and clearly and unequivocally condemn his disclosure, and refer Nunes' misconduct to the House Ethics Committee for further action. The hits just keep coming for Chairman Devin Nunes and Speaker Paul Ryan. Both Republican and Democratic lawmakers and aides who have seen the same documents explosively surfaced by Nunes in a March press conference have now stated that they found nothing unusual in the reports, and that these reports show no evidence that the Obama administration improperly surveilled the Trump transition team. Please share this information and our petition with your friends: let's keep the pressure on! That’s not enough: Nunes MUST go. Please ask your friends to sign this petition. Let’s keep the pressure on both of them. The NY Times reports that Devin Nunes met with two White House staff members to discover what he then refused to share with other committee members. One of them, Ezra Cohen-Watnick, had been fired by HR McMaster: a decision later reversed by Donald Trump. So, Nunes got his reports from White House staff, briefed Speaker Ryan, spoke to the press, then chose to report his findings to the President, completing this poorly drawn circle. Nunes has ZERO credibility and must resign or be removed. This already convoluted story is getting stranger by the day. Chair Nunes now claims that he met his 'source' on White House grounds [though denying that he met anyone in the White House itself] and did share information with Republican members of the House Intelligence Committee alone, prior to holding a hastily called news conference and heading off to brief the President. Nunes "was too mad" to first brief any committee Democrats. How can Nunes continue to lead this investigation?